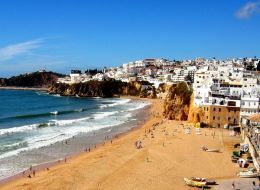 Compare prices from multiple car hire suppliers in Faro to find the best available deal. A few of the car rental companies we compare include Gold Car, Budget, Avis, Hertz, Sixt and many more. Faro is a city that lies along the southernmost border of Portugal. The city has a population of 41,934 inhabitants (2010). Faro is the capital city of the Algarve region. It is known for being a popular destination for those looking for a bit of sun, especially individuals from the United Kingdom and Northern Europe. The city has retained a reputation for being one large beach party amid stunning natural beauty and architecture influenced by the Moors. Visitors to Faro will want to go to the Old City, or Centro Historico. It is a very well preserved section of the city just off the harbor that boasts eighteenth century architecture and cobblestone-lined streets. It is also possible to take a boat trip to the Rio Formosa, a nature reserve. The primary beach in Faro is the Praia de Faro. Other things to see include the marina, the statue of King Alfonso III, and the old church and hospital. Faro is serviced by the Faro Airport (FAO). It is located just 2.6 kilometers from the center of the city. The airport is extremely busy during the summer months, serving over five million passengers. Airlines that offer flights to Faro include Aer Lingus, Air Berlin, British Airways, EasyJet, Lufthansa, Luxair, Ryanair, Thomas Cook Airlines Belgium, and Scandinavian Airlines.